Welcome to Boston, Science Teachers! Have a Free DNA App! The National Science Teachers Association (NSTA) is having its national meeting in Boston, April 3-6. Around 10,000 science teachers and school administrators are expected to attend. Given that I live a subway ride away from the meeting site, it was a no-brainer for me to take advantage of this opportunity to see what is going on the world of science teaching, to which I feel I belong, but only as a virtual teacher, making apps to teach science. I expect to talk to some of the people that have direct contact with students every day. I’m hoping to get some useful critiques of my apps, as well as making more people aware of them. As part of this effort to make more science teachers, especially biology teachers, aware of my suite of interactive DNA apps, I’m making OnScreen DNA Model for iPhone (usually $2.99) free for the duration of the NSTA meeting (through April 6). This app, except for the smaller screen size and consequent shorter DNA strands, is identical to the iPad app OnScreen DNA Model. The other OnScreen Science apps dealing with nucleic acids in the cell are iPad-only. I recently wrote about some good reviews they’ve received, including three for inclusion in the NSTA Recommends online database. Links (App Store buttons) to the other apps can be found in the right sidebar. 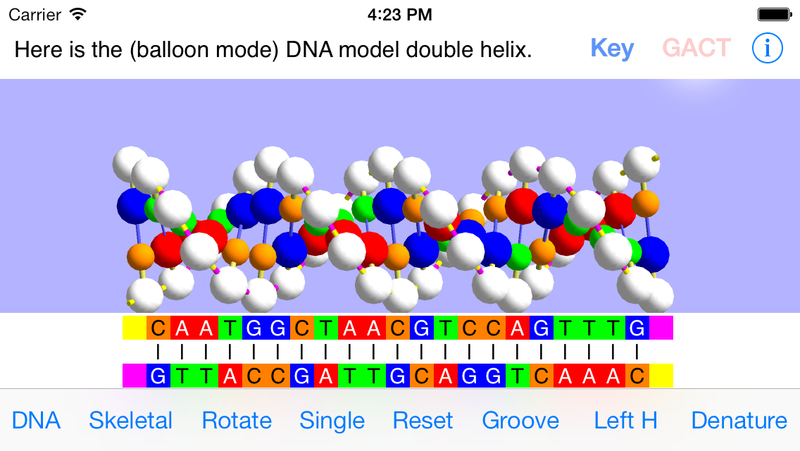 Of course, OnScreen DNA Model for iPhone is now free to anyone. Here is the link to the free app—OnScreen DNA Model for iPhone. Enjoy, spread the word, and, if you like the app, please go to the App Store to rate and review it.